Though the physical size of the sensor is known to have an impact on the overall image quality, sacrifices often need to be made to achieve smaller cameras. In the compact system camera range, the Four Thirds sensor used by Panasonic and Olympus allows smaller bodies and smaller lenses than would be possible with an APS-C sized unit. Sony and Samsung have stuck with the APS-C sensor and, though their latest camera bodies are small, their lenses remain quite bulky. 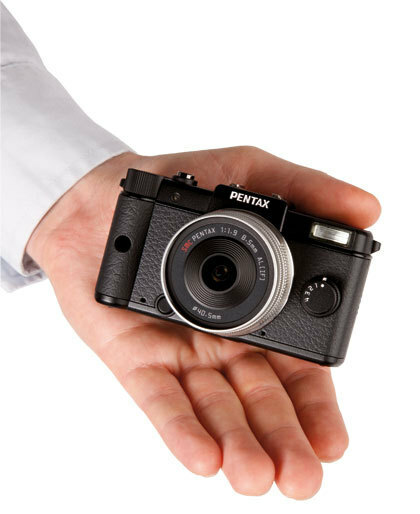 Pentax?s solution involves using a compact-sized sensor, and has enabled them to create the smallest (and lightest) digital interchangeable lens camera to date, with lenses to match. The Pentax Q then, seems like a slightly different take on the CSC ethos. The 12.4-million-pixel CMOS sensor is just 1/2.3in in size ? 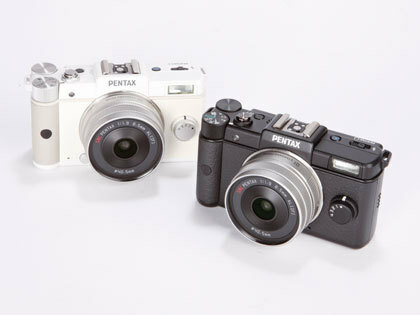 the same physical size as those that feature in many digital compacts, such as the Pentax Optio range. 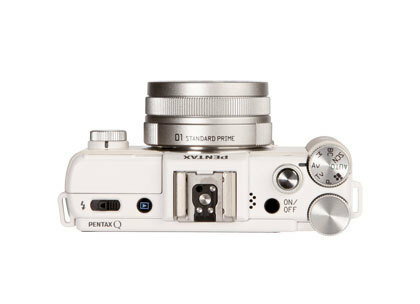 Though Pentax ensure us that image quality is still paramount. This is a brand new backlit high-sensitivity CMOS sensor, made by Sony and not yet used in any other camera. The Q engine processor provides 12-bit DNG raw or JPEG files, and gives a sensitivity of ISO 125-6400. The sensor is mounted on a shake reduction mechanism and is paired with brand new optics using the Q mount. 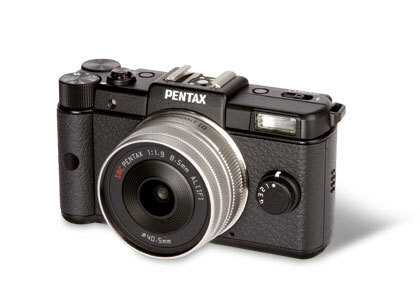 The choice of letter for the camera and mount, according to Pentax, stands for Queen, as the K in K-mount stands for King. However, there is plenty about this camera which suggests it could come straight from the lab of James Bond?s gadget man Q himself. When holding the Pentax Q it is noticeably smaller than any other compact system camera, and more like a compact, though more classically styled. Despite weighing just 180g the body is solid, made from magnesium alloy, the metal casing giving a real sense of quality in the hand. I took the opportunity to take some street photography shots along the Southbank with this final sample and found the compact size less conspicuous, and drew far less attention than even a regular compact system camera would. There was always a danger when a camera is so miniaturised, that it would become unusable creatively. However, the Q has some well-positioned buttons that allowed me to adjust the regularly used features, the most interesting of these being the quick dial on the front of the camera. This dial has four settings (and off) and can be assigned to different sets of functions, such as smart colour effects and aspect ratios. 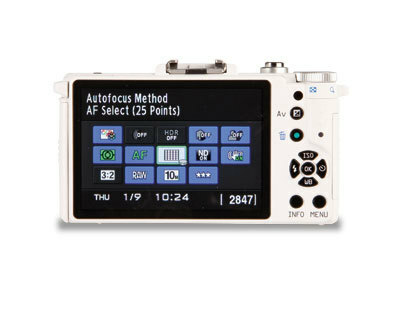 A small control dial sits on the top of the camera, providing the main adjustments, such as aperture or shutter speeds while other controls are accessed via several buttons on the rear or via the menu. The shutter button sits nice and high on the top but has little in the way of a half press, leaving me to rely on the beep or green light of the autofocus to confirm it had been pressed far enough and occasionally meant I took a shot by accident. Using the rear screen for composition seems natural on a camera of this size but the optional viewfinder accessory, which offers an optical view to match the prime kit lens, is likely to be a popular addition. Even with a large aperture, depth of field on the Q is vast, due to the small sensor size. To counter this, the Q features a Bokeh Control shooting mode, which processes the image to enhance the blurring of the background and increase the shallow depth of field effect. The Smart Effects are an extension of the digital filters and provide nine colour effects that can be added to the image at the time of shooting, such as Vintage Colour, Cross Processing and Bold Monochrome. The camera also includes a built-in ND filter to achieve slower shutter speeds and a selection of aspect ratios for shooting from 1:1 to 16:9. The mechanical shutter is actually in the lens rather than on the camera and this arrangement allows the Q to perform flash sync at up to 1/2000sec. Further features such as in-camera processing, including JPEG to raw processing, as seen on recent K-series DSLRs are also present in the menu, and there are a full selection of metering and white balance options to choose from. Having the DNG raw format means there is no issue with raw compatibility and so the files happily open into most editing programs directly. On first inspection, images from the Q look natural and highly detailed, without too much contrast or saturation added into the JPEG by default. Aside from the depth of field the quality certainly seems to hold up well to larger sensors, though this will need to be explored more fully in proper testing. The Q launches with a wide selection of lenses, including a series of four primes and one zoom lens. The standard kit lens is an 8.9mm f/1.9, which with a 5.5x magnification factor gives a 48mm equivalent, while the dual lens kit also includes the 5-15mm f/2.8-4.5 (27.5-83mm equiv). In addition to these two, there is a 3.2mm f/5.6 (17.5mm equiv) fisheye lens priced at £149 and two low-cost primes, equivalent to 35mm and 100mm for £139 each. The required image circle and the reduced flange back allow a mount diameter of just two thirds that of the K mount, and much smaller lenses than on any other CSC. The Pentax Q is due on sale in two kit forms, with the 48mm equivalent prime lens for £599.99 or the dual lens kit including the zoom for £729.99. This positions the camera against the current mid-range CSCs, above most of the entry-level CSC models including the Panasonic GF3 and Sony NEX-C3. This does seem a little high and whether photographers will pay the premium for the smaller form factor remains to be seen. While the additional lenses are reasonably priced, the optical viewfinder accessory is a significant £239, meaning for the dual kit and viewfinder you will need to spend almost £1,000. However, it is expected that some bundles will be offered including the viewfinder, which should reduce this slightly.